White Galaxy Nvidia GeForce GTX 770 Waterblock Spotted - Potential Watercooled HOF GTX 770? White Galaxy Nvidia GeForce GTX 770 Waterblock Spotted – Potential Watercooled HOF GTX 770? Word on the street is that Galaxy will soon make a watercooled addition to it’s Hall of Fame premium card series. The HOF series was launched by Galaxy in 2010. It consists of cherry picked reference GPUs with design upgrades to achieve greater performance specifications. According to Galaxy, the cards have been solely designed to enter the 3D Mark Hall Of Fame. HOF cards are generally air-cooled and this is what makes the appearance of this waterblock interesting. It now most likely means that a watercooled HOF will be released somewhere in the near future. Waterblock in Traditional White Galaxy HOF Design. Can Cover Entire PCB. 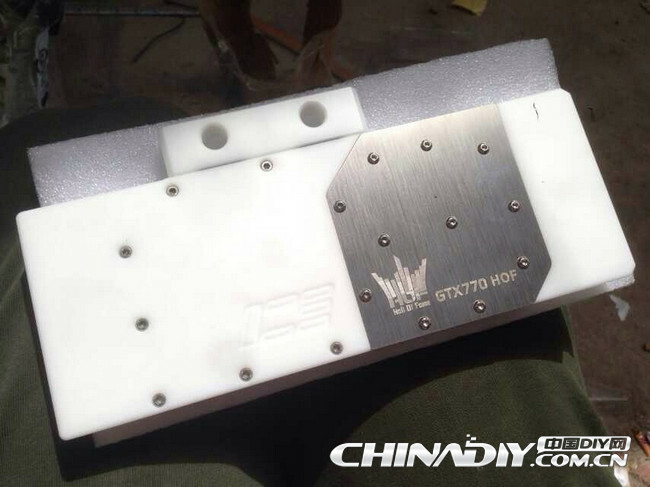 Courtesy of our friends over at chinadiy.com, we have been able to get our hands on some pictures of the waterblock. It is rather elegantly designed, with the main portion of the waterbody being white. Only the metal plate with the model name is in metal. The color choice of the card falls in line with the HOF. However, that is the only thing that it sticks to. 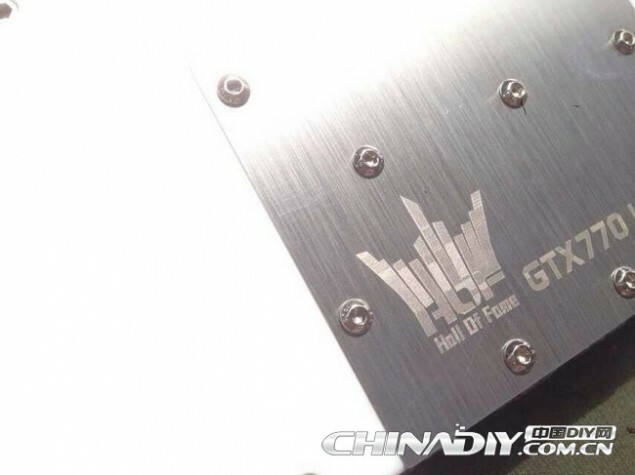 This reveal marks the first watercooled GPU of the HOF series. The body, as we can see in the picture above is quite large. This will allow the waterblock to be fully covered, in addition to efficient cooling of the GPU. Also, this complete covering of the PCB also ensures that the graphic card will remain stable during performance intense operations. This is because the memory and power supply components will also be covered and give more room for overclocking. In addition to this, the top part of the waterblock is reserved for other components and accessories. These include water cooling jets, mainstream market water cooled exhaust systems and pumps. It is obvious that Galaxy will include these components into the waterblock. The exact specifications and capabilities of these components are not known yet although. According to chinadiy, Galaxy’s manager marketing has announced plans for the release of a water cooled version of the GeForce GTX 770. Exact release dates are not yet known however it is expected that the card will be released at this June’s Computex.